Lonicera maackii (Rupr. ) Maxim. Trunks: Erect or ascending; bark brownish-gray. Twigs: Twigs moderately to densely pubescent; buds ovoid, hairy. Leaves: Opposite, simple; stipules absent; petiole 1/25 to 1/5 inch; blade ovate to elliptic, 1.4 to 4 inches long, .6 to 1.6 inch wide, base rounded to truncate, margins entire, tip acuminate, surfaces pubescent, not glaucous. Flowers: Pairs of flowers in axils of leaves on current year's growth; peduncles 1/12 to 1/3 inch. Sepals 4-5, calyx lobes triangular; corollas white, sometimes tinged pink near base, 3/5 to 1 inch, strongly 2-lipped, lips as long as tube, spreading, lower lip 1-lobed, upper lip 4-lobed; stamens 5, exserted; stigma capitate, exserted. Fruit: Berries, orangish red to red, globose, .16 to .28 inch; seeds 3-6, .1 to .2 inch. Comments: Lonicera, named for German herbalist Adam Lonitzer; maackii, for Richard Maach, a Russian naturalist. 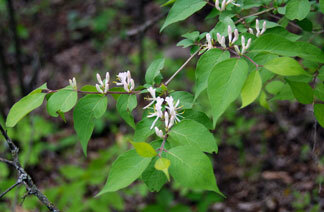 Amur honeysuckle was introduced in the late 1800s. At one time, it was widely planted for erosion control and for ornamental purposes. It is aggressively invasive and has become a serious problem in many areas. It has become a dominant understory species in woods, particularly near urban areas.